2. 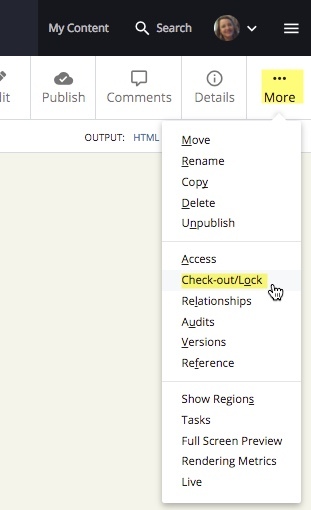 Click “...More” tab and click "Check Out/Lock"
While the asset is locked, no one can make changes to it. To save changes you’ve made to a locked asset, click “Commit Changes” then "Break Lock"
Selecting “Break Lock” without committing changes will discard all changes and unlock the asset. Note: Pages that you have locked appear on your dashboard under "My Content" and “Locked Assets”.